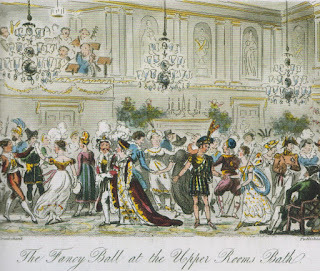 Dancing and attending balls feature prominently in all of Jane Austen's novels. The characters use these social occasions to advertise their availability, meet prospective mates, show off the latest fashions and observe strict social codes of behavior. It can all be a bit perplexing to modern readers. 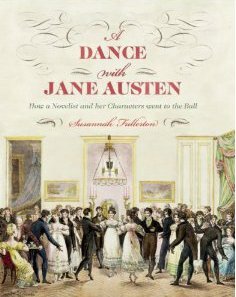 The delightful book A Dance with Jane Austen: How a Novelist and Her Characters Went to the Ball by Susannah Fullerton helps to sort it all out. 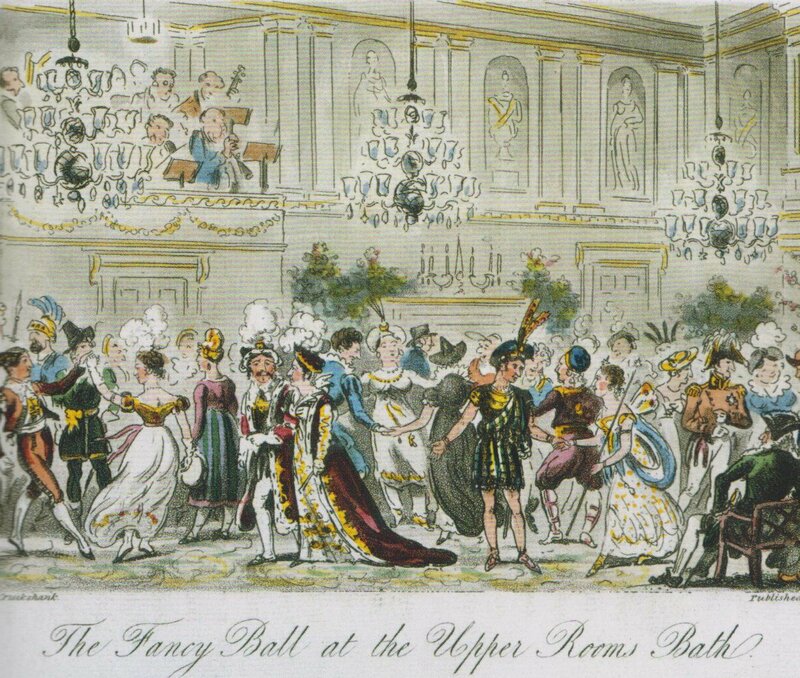 Using letters Jane wrote to her sister Cassandra, as well as drawing heavily from the novels themselves, the author examines all aspects of the ball and the huge importance it held in early nineteenth century society. There were many aspects to consider when preparing for a ball. First of all, it was assumed that everyone knew how to dance the most popular dances. This was achieved by having a "dancing master" come to homes for private lessons. This was made even more economical by inviting friends and family in the area with young people at home to come over and share in the lessons. Once the instruction was over, there were more practical matters to contend with. For instance, how are we to get to the ball? Well-off families had their own carriages, but unfortunately, many young unmarried ladies (including Jane Austen herself) had to wait for an invitation to either travel with someone or else stay over with them in order to attend a ball. Even if you were able to secure transportation TO the festivities, getting home was sometimes an entirely different matter. If you could afford it, you could also be carried in a sedan chair -- although since these were left outside in all weather, the inside would likely be damp and generally unpleasant, somewhat negating all the careful preparation in getting ready! All images courtesy of Frances Lincoln Publishers, Ltd.
After the practicalities were taken care of, it was time to get dressed. This was, of course, a very complex and intricate operation. Ladies who were advertising their availability as marriage prospects wanted to look their best. As well as a fashionable dress, the young lady also had to consider her hair (a complicated, elaborate hair-do likely involving feathers or jewels as decoration), dancing slippers (including "shoe roses"), gloves and fans. 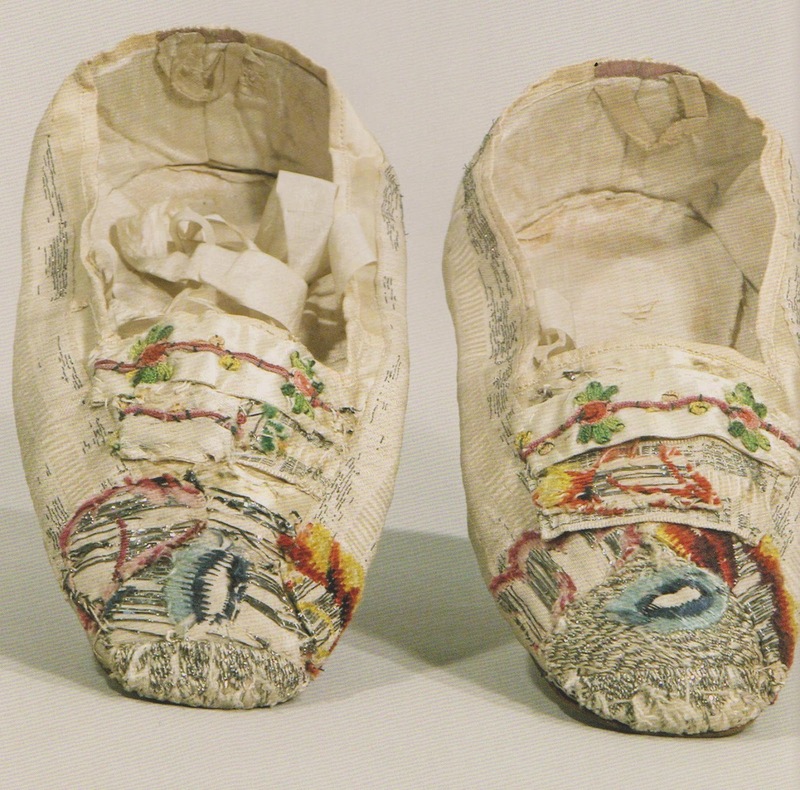 Fans were put to many uses including cooling off an overheated dancer, being used as a flirtatious device, hiding a reluctant maiden's eyes from unwanted suitors, and (more practically) being pressed into service as an impromptu note-taking device! Men were expected to wear knee breeches, silk stockings, frock coats and white gloves -- unless they were soldiers, of course, in which case their formal uniform would do. The different types of balls are also described (who knew there were so many?). There were the private balls, requiring a formal invitation and RSVP. Invitations were highly sought-after, since the balls were likely to be held in homes of high social stature. Another less-formal type of get-together was an informal ball, when rugs were rolled up and furniture pushed aside to provide room for dancing. In Bath, there were assembly balls held in public buildings. These often required tickets to be purchased, and eventually they allowed for the infiltration of all levels of society (even servants -- shudder!) into what had previously been an entertainment reserved for the better-off members of society. The last, and most exclusive, type of ball was the court ball. These were generally held at the Royal Palace of St. James to celebrate a royal birthday, and were stuffy and formal affairs. The book is beautifully illustrated with both contemporary drawings and paintings and more modern scenes from recent films. Included in the book are also historical sketches of real people who had an influence on the social history of dance, including Thomas Wilson, a dancing master who published over 15 dance manuals in the nineteenth century, and Beau Nash. Beau Nash was a "Master of Ceremonies" at the assembly rooms in Bath who set the rules for conduct and dress in the ballroom. Some of his "Rules to be Observ'd at Bath" (written in 1706) included such admonitions as "gentlemen do not ask ladies to dance until they've been formally introduced" and "a lady must accept an invitation to dance, or spend the rest of the evening sitting out all the dances." These rules were still scrupulously followed in Jane Austen's time, so having her characters behave in ways that didn't adhere to these rules allowed her to give readers all sorts of information about just what sort of people we were dealing with. For instance, Marianne in Sense and Sensibility violates another steadfast rule by dancing almost exclusively with Willoughby, rather than obeying her social duties to mingle and dance with others. This caused her to be not only the subject of gossip among her fellow ball-goers, but also shows the reader that Marianne is allowing her heart to overrule her common sense (which will surely lead her into serious trouble, as we soon see). I really enjoyed learning all these aspects of balls and what great importance they had in society during Jane Austen's time. The book does a wonderful job of showing how the characters are constrained by all the "rules" they must follow. By using examples from all of Jane Austen's works, we can better understand the social customs which everyone was expected to obey. Disclaimer: I received a review copy of A Dance with Jane Austen from Frances Lincoln Publishers in exchange for this review.